SANDRA ROWE was born and spent most of her childhood in Richmond, Indiana. She received a Bachelor of Arts from Cal State University, Fresno and then a Master of Fine Arts from UC Irvine. She is an installation artist who uses different media including video, sculpture, and painting. 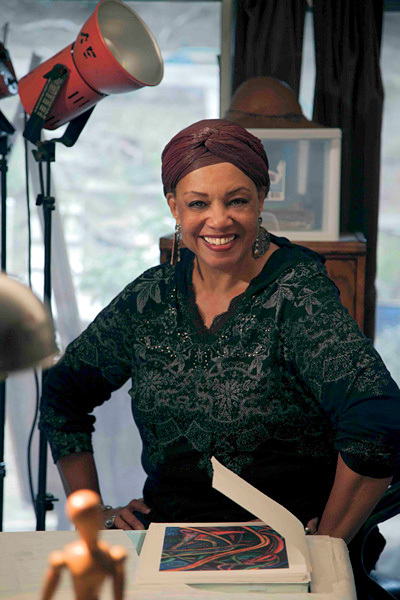 She has had solo exhibitions in Los Angeles and New Hampshire including the California Afro-American Museum, and the Bowers Museum in Santa Ana, CA. Public commissions include the Arrowhead Pond in Anaheim; Hollywest, done with ARBA and Nadel Architects; the Children’s Tile Project for the California Towers, Riverside; the Northridge Medical Clinic; and Art in Public Buildings in Corte Madera Town Center, CA. She lives and works in Riverside, CA.